Like a good Cal student, I’m working on a blog entry instead of writing my paper because I love ya’ll so much. Horray for me! Now for most trends I’m usually impartial or very slightly amused by them; take for example the prior leopard scarf post. However, a trend that I least expected to come back so soon has arrived. It made constant debuts at your middle school promotion (or at least in mine) and some dare-devils carelessly threw this on for the past couple of years. But it’s back, though I’m afraid not for long… the polka dot! I’m always raving about how genius the recent Lanvin collections are, and the 2009 resort was no exception. It’s difficult to grasp Alber splashing any sort of print or embellishment (beside the bow, of course) on his work, so it’s odd to see the scattered polka dots on this pink dress. A nice change can come with some effort. To avoid looking like you threw on your old clothes, try something similar to this dress from Target (http://www.target.com/, $6.24). Since it’s so cheap, you would have to spruce it up like you would with something from a thrift shop. Shorten the length and take off that gawd-awful smbelt in the middle. Replace it with a hardware belt, similar to this one from Urban Outfitters (http://www.urbanoutfitters.com/, $16.99) and you’re ready to go. By the way, the close up pictures on the website show the dress with really cool scribble-esque dots. 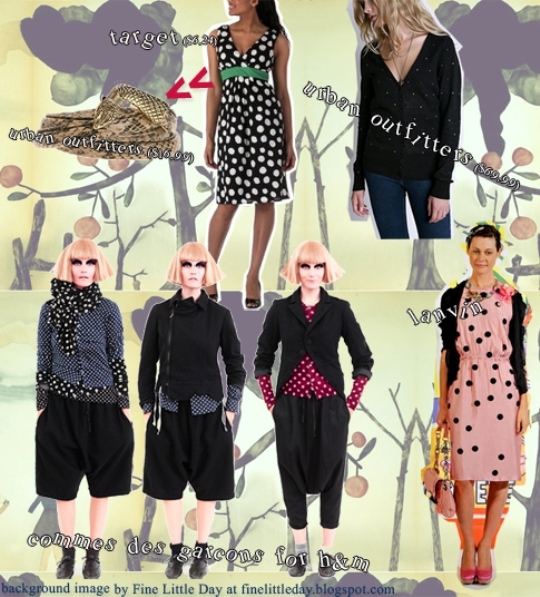 Now which fashionista can forget about the Commes des Garcons for H&M that recently happened? The mainstream polka shirts and bags and what-have-yous are sadly no longer even on ebay. But fear not, because I found a similar cardigan with more demure dots at Urban Outfitters (http://www.urbanoutfitters.com/, $69.99) that would look great layered under a coat. It’s certainly hard trying to find some decent polka dots nowadays. By changing the texture, size, and pattern of polka dots, you won’t have to look like you stepped out of the runway…circa 2000. Also, try some of the great vintage stores around Berkeley that might have cheap options, since I don’t think this trend is on the dot. Haha. This is great! You're right I donbt think this'll stay for long. But polka dots are so fun!